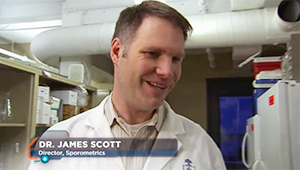 Tune in to Daily Planet April 30th, 2013 at 7 PM EDT on the Discovery Channel to watch our Sporometrics guys swabbing pets and people to find out how much of our microbiome we share with our companion creatures. The segment, hosted by microbiologist and puppy enthusiast Dr. Jennifer Gardy from BCCDC, will feature our dogs, Aurora and Rawley, Dr. Richard Summerbell’s dog Fleefus (the best-behaved) and our protesting kitten, Tunafish Betty, along with Richard himself, Yordanka Guardiola and (a very reluctant) Ed Hollis. Everyone had a blast, particularly the dogs. And even after a day of dog slobber, our hands remained surprisingly free of microbes!